Comments : Bill is an eccentric, insane (according to Gideon), possibly psychotic, and physically irreverent demon who finds most things amusing (although no one is really sure why). He's outrageous and outlandish, as well as a quick talker and thinker. Though he may come across as simply annoying, he's not to be taken lightly; when angered, he's a force to be reckoned with. 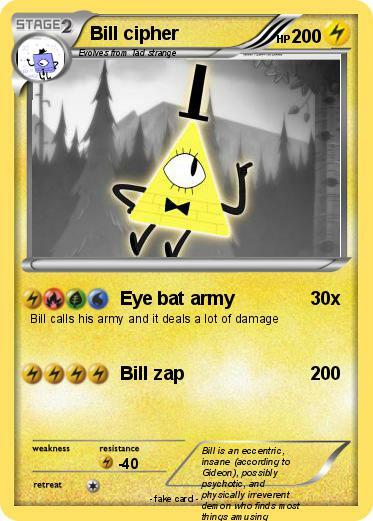 When possessing Dipper's body, Bill is shown to be rather masochistic, hurting himself in various ways for the thrill of it, finding pain "hilarious." He seems to have little knowledge about the human body—specifically its physical limits.